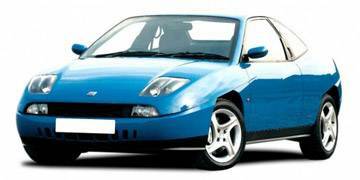 Read our helpful guide to second hand Fiat Coupe. AA Cars works closely with thousands of UK used car dealers to bring you one of the largest selections of Fiat Coupe cars on the market. You can also browse Fiat dealers to find a second hand car close to you today. All used Fiat Coupe on the AA Cars website come with free 12 months breakdown cover. The Fiat Coupé is a very affordable sports coupé which offers plenty of style as well as substance. It might be far and away from the better known and more dynamic sportscars produced by its compatriots Ferrari and Maserati, but considering the price differences, the two cars are equally as desirable. A 155mph top speed and 6.5 second 0-60 sprint time is evidence of its sporting prowess, while the cabin is comfortable and stylish to match the sleek outside. Although hard to come buy, the Coupé is an excellent value, dynamic and exciting sportscar.